It was a famous army, but it is not always understood. It was praised for introducing a revolution in the art of war and notorious for the brutality of its discipline, but how did this army really work? This is a study of the greatest army of its time by the finest historian of the wars of the 18th Century. The Prussian military machine is analyzed in detail, from top to bottom, from the mentality of the Junkers who led it to the way the men were clothed. The tactics, the recruitment, the finances of the military are laid bare. This is much more than a technical study, as we see how these regiments stood up to the test of the bloody battles of the Seven Years War and the long years of virtual imprisonment in barracks. 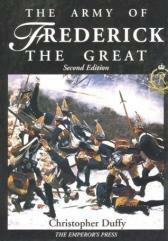 The image of a formidable army forged by fear rather than leadership proves to be only partly true, but the tribulations of serving a hard taskmaster like Frederick the Great are well described by soldiers and observers of all ranks. The classic study of one of history’s most famous armies has been heavily revised and updated through twenty more years of research and consideration. Now we can see the rise of the cavalry from the ridiculous to the superb, the once invincible infantry bleed white, and the light forces change from being negligible to being the terror of their enemies. A great army is made flesh and blood.